While many are heading to traditional polling stations to cast their local election vote, some people in Swindon have already cast theirs online. Since early last week, people have been able to use the internet to vote at home, at work or via laptops in five libraries around the town. It is all part of a wider scheme to try to get more people involved in local politics and make it easier to cast a vote wherever one is. More than 13,000 people pre-registered to cast their vote electronically this year and were sent their login details. But on about 1,000 cards one or two leading zeros were missed off the personal ballot number which left them unable to login. Corrected cards were sent out straightaway and anyone calling the council's voting hotline was advised of the error. 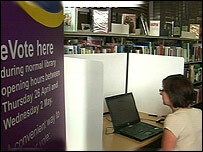 People voting in the libraries have been largely enthusiastic about e-voting. Deputy returning officer Alan Winchcombe said he was at one of the sites on Sunday and met a 79-year-old man. "He told me he'd never had a computer or used the internet but had no problem using the e-voting laptop." On Thursday, all of the town's polling stations will have between two and eight laptops depending on size. Voters can go into any polling station in the town to cast a ballot rather than the one nearest to home. People arriving to vote identify themselves to the clerk and are then told to go into a particular booth. When they enter the cubicle, a monitor displays the voting screen. For those who have not made their minds up, a few clicks can bring a photo of each candidate on screen and a short biography. Voting is carried out by putting an electronic cross on the screen then, once confirmed by another click, voting is done. A further option allows voters to request a receipt. In this case a new password is entered and once the election is over the voter can login at home or work, enter his details and the electronic vote slip appears on screen together with his cross. Each polling station still has one booth where the voter can mark his "X" on paper. Since 2000, the borough council has piloted a number of alternatives to the ballot box. Firstly it trialled all-postal ballots in four wards. In May 2002 15,000 people voted by internet or telephone rather than marking a cross on a form. More than 15% of votes were cast digitally and turnout increased by 3.5%. 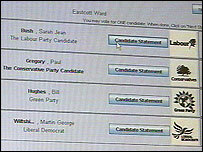 Electronic options were widened in 2003 with voting via interactive TV and street kiosk voting being added. Yes, explained Mr Winchcombe. By failing to select any candidate on screen or by voting for more than one candidate. "But you will get a warning on screen asking if this is really what you want to do though," he added.